New iMac processors feature up to 18 cores! 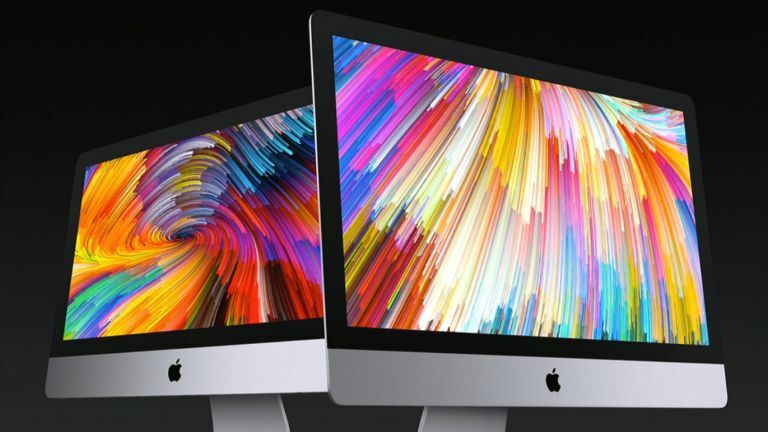 There's a new, ultra-powerful 27-inch iMac Pro featuring a processor line-up with up to 18 cores and up to 16GB of video memory. The iMac Pro will be with us later this year, but there's plenty of other Mac news - read on! The announcement was made at the developer conference (WWDC) that the tech giant holds each year. The clue's in the same: this is mainly aimed at mobile and desktop app makers, but there are always plenty of more consumer-focused updates. The new iMac Pro is the new workstation-level Mac we've been waiting for. it features a 27-inch Retina 5K display, up to 18-core Xeon processors and up to 22 Teraflops of graphics computation. Apple says that iMac Pro is scheduled to ship in December starting at $4,999 (US). There's also updates to the 'standard' iMac range. We're talking better screens, more memory, the latest Intel Kaby Lake 7th gen processors, more storage and two USB Type-C ports with Thunderbolt 3. There's also a retina 4K display and discrete graphics added to the £1,249 21.5-inch iMac. Apple's MacBook line is getting refreshed too, but it's only a small update, with the MacBook, MacBook Pro and MacBook Air all getting faster chips and SSDs. The updated 13-inch MacBook Pro features Kaby Lake processors up to 3.5 GHz Core i7 with Turbo Boost up to 4.0 GHz, and the 15-inch MacBook Pro goes up to 3.1 GHz Core i7 with Turbo Boost up to 4.1 GHz. There's also a new £1,249 13-inch MacBook Pro variant. The 15-inch MacBook Pro now comes standard with more powerful discrete graphics with more video memory. Apple also updated the 13-inch MacBook Air with a 1.8 GHz processor.